This engraved square oil or vinegar swing top bottle is 125ml and is approximately 14.5 cm high by 5 cm wide. 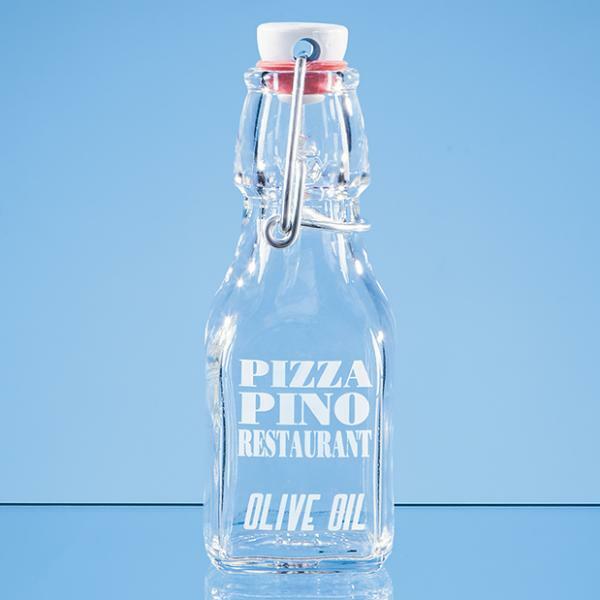 The oil and vinegar swing top bottle has a white cap and includes in the price up to 50 characters engraved for free to personalise the square one litre bottle. Any additional characters are then charged at 25p each, and there is an additional cost for a logo. The vinegar or oil bottle is supplied in a blue cardboard gift. The engraving area of the engraved oil / vinegar swing top bottle is 4.5 cm by 3.5 cm. The postage rate for the engraved oil or vinegar swing top bottle is band B. Please note this bottle is not suitable for carbonated drinks or sparkling water.